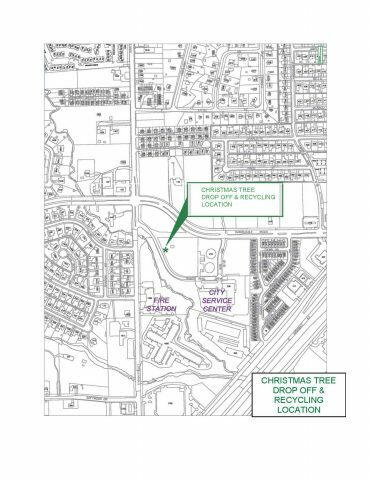 The City of Duncanville will pro­vide Christmas tree recycling beginning December 29 through January 31st at the Service Center located at 330 Shady Trail. Residents may drop off their trees in the grassy area by the existing mulch pile on Shady Trail near Main Street (there will be signage to direct you to the area). Christmas trees must be free of lights and decorations and cannot be in any type of wrap, especially plastic. The mulch is provided free to residents. For more informa­tion, contact the Service Center at 972-780-4900. 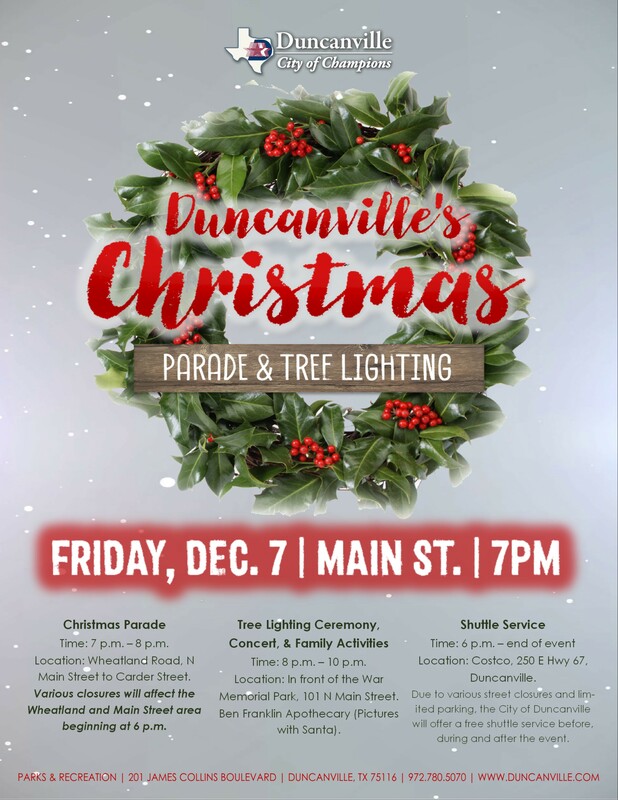 In celebration of the Christmas Holiday, the City of Duncanville is hosting the annual Christmas Parade & Tree Lighting on Friday, December 7, 2018. This year’s festivities will feature the annual parade down Main Street, pictures with Santa, the tree-lighting ceremony and much more. To View the Christmas Parade & Tree Lighting flyer click here. Time: 7 p.m. – 8 p.m. Location: The parade route will extend from Freeman to Wheatland, Wheatland to Main and dis-embarking on Main at Carder. Special Info: To participate in the parade, please register with the Parks & Recreation Department at 201 James Collins Boulevard, Duncanville. To download a Parade Registration from click here. Various closures will affect the Wheatland and Main Street area beginning at 6 p.m. For any questions regarding the parade, contact Recreation Superintendent Veronica Williams at 972.780.5074 or vwilliams@duncanville.com. Description: The Christmas Tree Lighting and Concert will feature commentary by Mayor Barry L. Gordon and the music of Duncanville ISD’s Elementary & High School Choirs. Time: 8 p.m. – 10 p.m. Location: In front of the War Memorial Park, 101 N Main Street. Description: Enjoy the festivities hosted by the City of Duncanville’s Park & Recreation Department which includes pictures with Santa and more! Location: Ben Franklin Apothecary (Pictures with Santa). Special Info: To become a vendor for this event, register with the Parks & Recreation Department located at 201 James Collins Boulevard. Description: Due to various street closures and limited parking, the City of Duncanville will offer a free shuttle service before, during and after the event. Location: Costco, 250 E Hwy 67, Duncanville. Special Info: To catch the parade, park and ride from Costco to the Phase I stop located at the southeast corner of Main and Wheatland at the Dallas County Tax Office. After the parade, road closures will open allowing the stop to progress to Phase II, located adjacent to the Main Street activities at West Freeman and Main Street. Media All media will be located in front of Roma’s Italian Bistro during the event (100 S Main St #102). Please contact Recreation Superintendent Veronica Williams at 972.780.5074 for further details regarding media coverage. For general questions regarding the Duncanville’s Christmas event, contact the Parks & Recreation Department at 972.780.5070 or visit www.duncanville.com. The Duncanville City Council is currently accepting applications from citizens interested in volunteering their service on the Library Advisory Board. To be eligible to serve, one must be a resident of the City of Duncanville, and not be in arrears on City of Duncanville ad valorem taxes or fines or fees. Anyone interested in serving is encouraged to forward a completed application to Kristin Downs, City Secretary, P.O. Box 380280, Duncanville, Texas, 75138-0280; to kdowns@duncanville.com; or in person at City Hall, 203 E. Wheatland Road. An application may be obtained at City Hall or by visiting the City’s web page at www.duncanville.com. For more information, please call 972-780-5017. For more information on our Library Advisory Board please click here.